As it’s almost summer here in Australia (the weather was super hot today) I’ve been looking and scrolling endlessly through online shopping websites at the hope of finding more summer clothes. One of the online stores I see a lot of people buying from is Zaful. And the pieces I see them pick up is just incredible – style and quality wise. So, I decided to hop onto the website and pick a few of my favourites from there. Dresses are probably one of my favourite things to wear during the summer. Only because it’s so easy to put together and also super easy to dress up or down as needed. 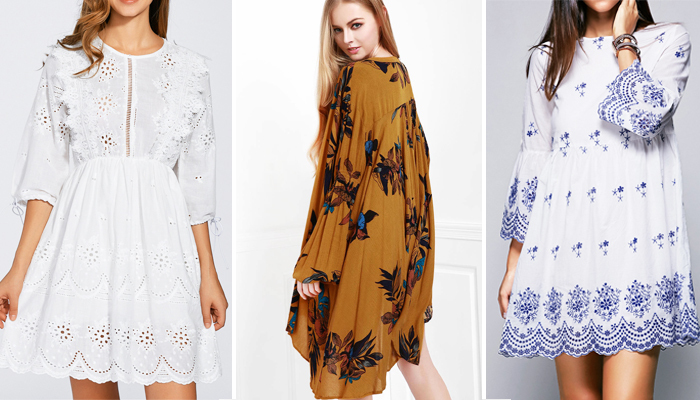 I picked these three dresses because not only are they super pretty but also super summery. I love the first Embroidered Eyelet White Dress and the third Flare Sleeve Retro Embroidery High Waisted Dress a lot simply because they’re very chic and elegant but also quite casual. How perfect are they for the spring/summer?! And I love the the second mustardy Floral Keyhole Neckline Long Sleeve Dress. It’s just so flowly and summery! Okay so I love playsuits. 70% of my wardrobe is filled with playsuits and I think they’re the perfect summer outfit. I love first Collar Sleeveless Khaki Playsuit / Romper. I love the colour and the style of this. 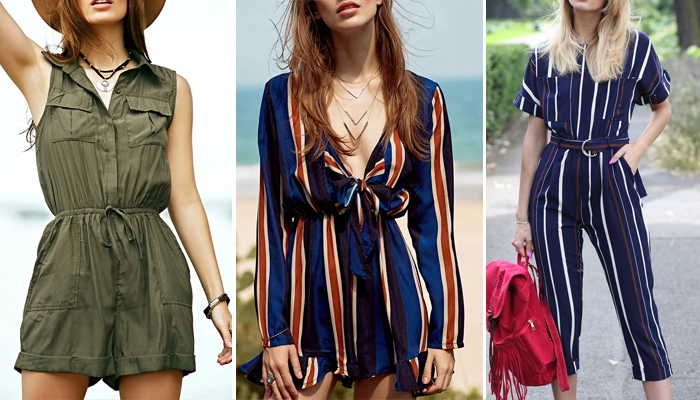 The second Tie Front Striped playsuit is so gorgeous. I’ve seen this playsuit around A LOT on instagram and everyone just looks so fab in it. I love the style and the flared bottom. The third jumpsuit – Striped Round Neck Short Sleeved Jumpsuit – is just so pretty. It’s a similar print to the second playsuit but I love the style of this jumpsuit. I also love that it’s not full length which is great for us shorties! I’ve been on the hunt for a denim dress for agessss now and haven’t found the perfect one yet. So, when I saw this Embroidered Puff Sleeve Denim Dress I thought it was super unique and cute. I’ve also been on the hunt for sets! Aren’t they just the easiest to put together and they are perfect for the summer. Not only do they go well together but it’s super easy to throw on and you don’t even need to think twice about what to pair with the shorts you’ve chosen because you’ll have the top and shorts sorted! The first one – Floral Print Cropped Top and Shorts Twinset – is just super summery. I love the halter style top and the print. It’s very summery. The second Backless Cut Out Stand Neck Top and High Waisted Shorts is also gorgeous. The style is super pretty with the halter neck top and I love how it looks like one piece. Have you shopped at Zaful?